Review: Kay and Arnold have been married for 30 years. Kay now feels like she wants more from her marriage. The couple attend an intense, week-long relationship counsellor to work on their marriage. I was honestly expecting this to be much better than it was as David Frankel directed the fantastic The Devil Wears Prada, 2006 which I thoroughly enjoyed. This for me didn’t work at all. I don’t think comedy suites Meryl Streep as well as straight Drama. The film as a whole does not work. 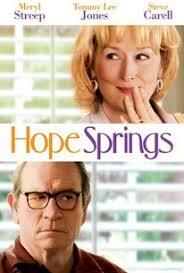 Meryl Streep and Tommy Lee Jones are both exceptional actors but totally the wrong part for both of them. I know it is not either of their faults. Jeff Bridges was originally offered the role of Arnold but turned it down. I think it was the right decision. Even though this has had good reviews with all the critics for me it just didn’t work.